Mario Cristobal is not Chip Kelly. Kelly is an offensive mastermind, whose fast-paced, spread-option system took the country by storm. His innovations, matched with some of the most dynamic athletes in the game, led the Ducks to their most successful period in team history. But for all of his acclaim, Kelly couldn’t get over the hump. Although his offensive brilliance allowed the Ducks to steamroll most of the country, the few teams that had the talent to challenge the Pac-12 powerhouse found that for all their flash and bravado, the Ducks had a way of cracking under pressure. Early indications suggest that Cristobal’s Ducks aren’t cut from the same cloth. It’s yet to be determined whether he can replicate Kelly’s offensive success, but Cristobal’s version of the Ducks is showing something that Kelly’s could have used more of: resilience. There’s a drive and perseverance in the face of adversity that has shown itself on the field this season that was sometimes hard to find in Kelly’s teams. That never-say-die mentality is an important foundation, and it is one that Cristobal may well use to bring the Ducks to the heights that Kelly never did. The Ducks’ offense was grounded against Stanford in 2012. On a chilly Thursday night in November 2012, the top-ranked Ducks faced Stanford, just three wins away from a national-championship berth. It was Oregon legend Marcus Mariota’s freshman season, and he was leading Kelly’s best-ever offense. The Ducks were absolutely demolishing teams, rushing for more than 300 yards and scoring over 55 points per game. No team had come close to stopping the Ducks’ vaunted offensive attack, which was generating talk as one of the greatest offenses in college football history. All those numbers and accolades went out the window on that fateful November night. The same Oregon offense that hadn’t scored fewer than 40 points in any game that season mustered a paltry 14 against a stifling Stanford defense. All of the misdirection, tempo and speed that had dumbfounded every other opponent that the Ducks had faced failed to overcome a disciplined Stanford defensive front. 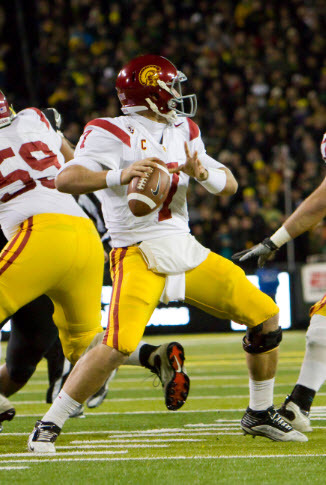 USC upset Oregon in 2011, costing them another shot at a national championship. As the game wore on, viewers across the country kept waiting for the Ducks to wake up and blow past the Cardinal, as they had against everyone else. Surely, one of the brightest offensive minds in the sport had to have some trump card — some stroke of genius — to overcome a solid but not impenetrable defense. Stanford coach David Shaw knew his team was out-manned, but he also knew that if he was able to withstand the Ducks’ barrage long enough, he would expose their biggest weakness: their inability to deal with adversity. Things were easy for the Ducks when their scheme worked as intended and they were able to overwhelm hopeless defenses. But when the Ducks faced teams that were able to go toe to toe with them, they were out of their element and seemed to have trouble finding answers. One of Kelly’s biggest flaws was a failure to instill in his team the resilience necessary to win when his offensive system was compromised. That doesn’t appear to be an issue with Oregon’s current head coach. 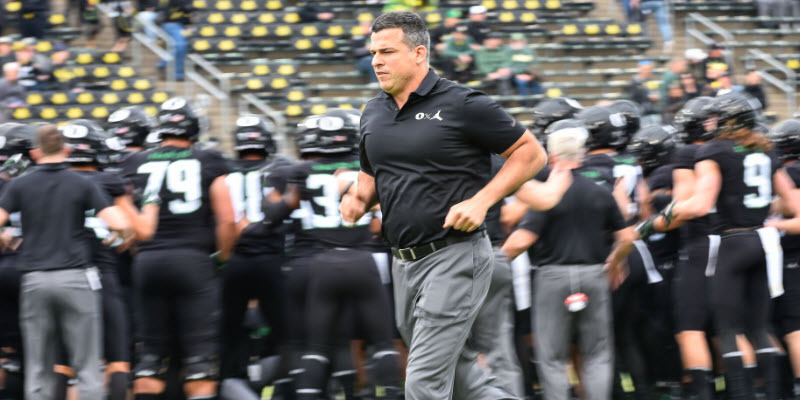 One thing that is evident from Cristobal’s inaugural season as the Ducks’ head coach is that the team is now a fearless bunch with boatloads of determination. Even in their infamous loss against Stanford this season, the Ducks fought like heck until the end, and they nearly made enough plays in crunch time to prevent the disastrous defeat. The Ducks nearly held off the Cardinal’s comeback. 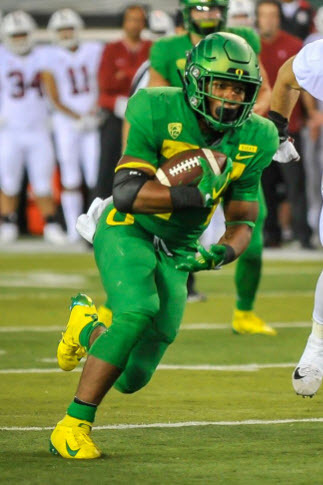 Many forget that, after the Cardinal seized the momentum with an 80-yard scoop-and-score and a Bryce Love touchdown scamper, the Ducks fired back. Previous Oregon teams would have been hard pressed to stop the bleeding, but these Ducks asserted their will with an 11-play, 70-yard touchdown drive in the waning minutes of the fourth quarter. Then, after Stanford roared right back with a quick scoring drive of their own, the Ducks once again rose to the occasion, making a key third-down conversion to enable them to run out the clock and win. Unfortunately, a young tailback fumbled the ball away, and with it the game. How did the young Ducks respond to such a heartbreaking defeat? They didn’t hang their heads and feel sorry for themselves. Instead, they throttled a solid Cal team the following week and went on to upset conference-favorite Washington in another game that demonstrated that the Ducks are now perfectly comfortable in a high-stakes dogfight. 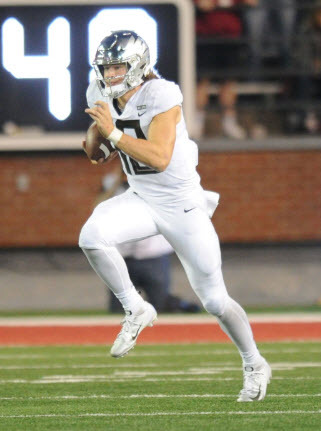 Justin Herbert led a furious comeback attempt against Washington State. A week later, the Ducks faced their greatest challenge yet, as they fell into a 27-point deficit entering halftime against Washington State. With the game seemingly decided, disgruntled Oregon fans were already hitting the exits. But the Ducks didn’t flinch. Instead, they put together a furious second-half rally that nearly resulted in a stunning comeback. The offense woke up and challenged a Cougar defense that was suddenly on its heels after controlling the game in the first half. And the defense shut down one of the best offenses in the country, holding them in the second half to a mere seven points. Again, their efforts fell short, as Washington State hung on to win 34-20, but the Cougars had to sweat out a second half that the Ducks made surprisingly competitive. While their record this year may be disappointing to some, the Ducks have faced an uphill battle, entering the season with their third head coach in as many years. They have, as a result, taken their share of punches from a formidable list of conference opponents. But unlike in some years past, they have also thrown their share of counterpunches, suggesting they’re more adept at dealing with adverse situations. When evaluating Cristobal’s performance so far, many fans are quick to point to the Ducks’ under-performing offensive system and write him off as a failure. The same fans are often effusive in their praise of Kelly and his exciting, high-flying teams. Admittedly, those teams brought the program to the doorstep of the college football elite. But when it mattered most, all of Kelly’s schematics and innovation weren’t enough to push the Ducks past the doorstep and into the promised land. If championships are the standard that Oregon coaches are now held to, then Kelly ultimately didn’t deliver. Maybe it’s time to look at some elements of championship teams that aren’t as entertaining as Kelly’s, but are perhaps more important. They’re what helped Deshaun Watson overthrow Alabama’s empire and Vince Young become a college football legend. Those elements are pure desire, effort, heart and grit. They are the intangibles that come to the forefront when no level of football expertise can overcome an obstacle. Cristobal’s Ducks are developing these intangibles. If they keep developing them, they will be a threat for years to come.